Michael Wolff's fair and balanced biography of the controversial media mogul is well worth reading. The Man Who Owns the News: Inside the Secret World of Rupert Murdoch. Michael Wolff. Broadway Books. 464 pages. Scan the online comments accompanying most current stories about the travails of the newspaper business and you'll invariably encounter declarations that most problems are caused by a dearth of ''conservative'' views. Forgetting for a moment that the definition of this ideology has become amorphous (believe it or not, ''conservative'' once included small government, individual freedom and lack of government interference in personal issues! ), the idea that media in general and newspapers in particular are ''liberal'' is laughable. Most are owned by large corporations whose interests are hardly radical, socialist or anything other than determinedly capitalist. They are in business to earn revenue, not for ideology. A few big city daily newspapers that lose tons of money are, indeed, kept afloat for mostly ideological reasons. 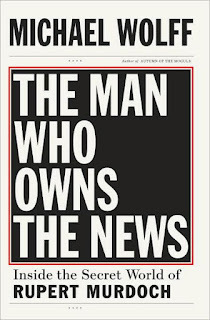 Both are ''conservative'' and one, the New York Post, is owned by Rupert Murdoch, the subject of this new biography by journalist and sometime-entrepreneur Michael Wolff. According to the author, the money-losing Gotham tabloid is less a propaganda vehicle than a means of providing its freewheeling CEO with a political presence in that media capitol. But with the company's acquisition of the Wall Street Journal and its parent company, Dow Jones, owning the Post, which bleeds an estimated $50 million a year, may be an unnecessary extravagance. The acquisition of one of journalism's crown jewels serves as the central point to cover Australian native Murdoch's childhood, education, marriages, family and the rest, reinforced by substantial research and interviews with the subject, his wives, children and other principals, including former British Prime Minister Tony Blair. Beginning as the son of the owner of a local paper, Murdoch's empire has grown to include television networks, a film studio and several newspapers, an industry to which the subject seems unnaturally drawn. Wolff tries to make sense of this predilection and gets into somewhat dodgy territory when he does, but it's no great matter, as one can take or leave any psychobabble. He's a terrific and engaging writer, with a few tics and asides that distract but mostly add what rappers call ''flava'' to the proceedings. Though some quotes and thoughts seemed, at first, to be pop-psych and Woodwardian telepathy, copious endnotes mostly proved otherwise. Murdoch is commonly presumed to be a political mover, mostly evidenced by the right wing ministry of propaganda that is cable channel Fox News, though his UK Sky News is, according to Wolff, its ''mirror image,'' meaning that unlike FNC, it's fact-based and/or liberal. Murdoch's latest wife, Wendi, is, according to Wolff, a moderating force, so her husband's pals now include progressive stalwarts David Geffen and Barry Diller, though the author maintains that Murdoch's main allegiance is to his own fortunes rather than any ideology. The inside stuff on the WSJ acquisition could have easily been a separate volume — and it's worth noting that the transaction was made at the peak of the company's value, for which he paid $60 a share. It's now worth far less. But Wolff's laudable attempt to create a fair and balanced portrait of the singular, self-made and motivated Murdoch results in a book that's well worth readers' time.